In 2010 the Wrestlingworth & Cockayne Hatley Parish Council agreed to allow PWWG to manage an old gravel pit within the parish as a nature reserve. Gravel has not been extracted from the workings for at least 150 years and, apart from some tipping at the north end of the site, has remained largely undisturbed since then. The Wrestlingworth Enclosure Act of 1801 records that the gravel pit was located in Lousy Bush Meadow. We therefore named the reserve the Lousy Bush Nature Reserve. An article by local naturalist Ian Woiwod which was published in 'Wild about Beds'. A list of birds spotted at the reserve. A list of mammals spotted at the reserve. A list of insects spotted at the reserve. 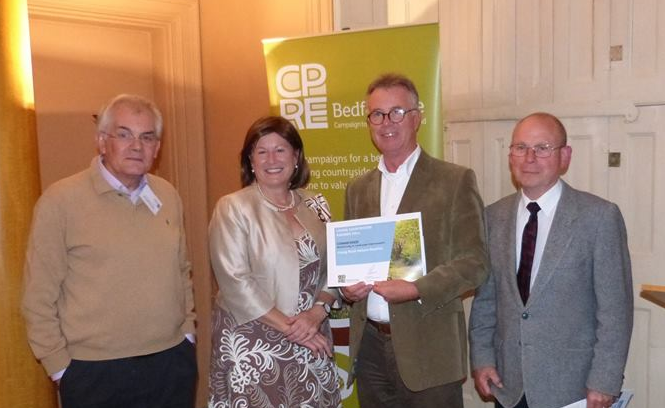 The PWWG Lousy Bush Nature Reserve received a 'Commended' award in the Biodiversity & Landscape Improvement category at the CPRE Bedfordshire's Living Countryside Awards. The award was presented by HM Lord-Lieutenant of Bedfordshire, Helen Nellis at an awards evening on 7th October 2014 at Moggerhanger Park. This award goes some way to recognise the tremendous efforts put in by the team to date in getting the reserve set up. We still have lots to do so if you are interested in getting involved in this long term project, please get in touch.